Visit Falkirk and marvel at the magnificent Kelpie and Falkirk Wheel. On Sunday morning, we woke in the Trossachs to a miracle – it was sunny! We’d spent the previous night at a rather good, cheap as chips two star motel on the outskirts of Aberfoyle. While we’d struck gold with our bargain accommodation, the same couldn’t be said for the weather – it had been a washout. Desperate to enjoy a rain free morning, we rushed off to breakfast for it starting. Usually we enjoy a quiet breakfast on our travels, while our fellow guests still slumber. Not this time, this time we were beaten to breakfast by a large coach party of pensioners, or Saga louts as we later dubbed them. The blue-rinse brigade pushed, shoved and jostled us in the buffet queue like they hadn’t eaten in a month. Emerging from the queue with our breakfasts chosen under duress, we found a table as far away from the bad-mannered old gits as possible. Before heading back to Edinburgh we planned to spend a couple of hours hiking in the scenic Duke’s Pass. The next deluge of rain was forecast for midday, so we had several rain free hours to enjoy. Or so we thought – we’d barely wound our way up into the pass when the sky turned black. A little light drizzle won’t hurt us we said, trying to remain upbeat. It’s not due to rain for hours – and cue the heavens opening! A quick change of plan, and we left a rainy Duke’s Pass behind. We were now off to visit Falkirk bound to see The Kelpies, the Falkirk Wheel and Scotland’s oddest summerhouse, The Pineapple. The Kelpies are a majestic pair of equine giants, which rise from an intersection of the Forth & Clyde Canal in an area of reclaimed parkland known as The Helix. 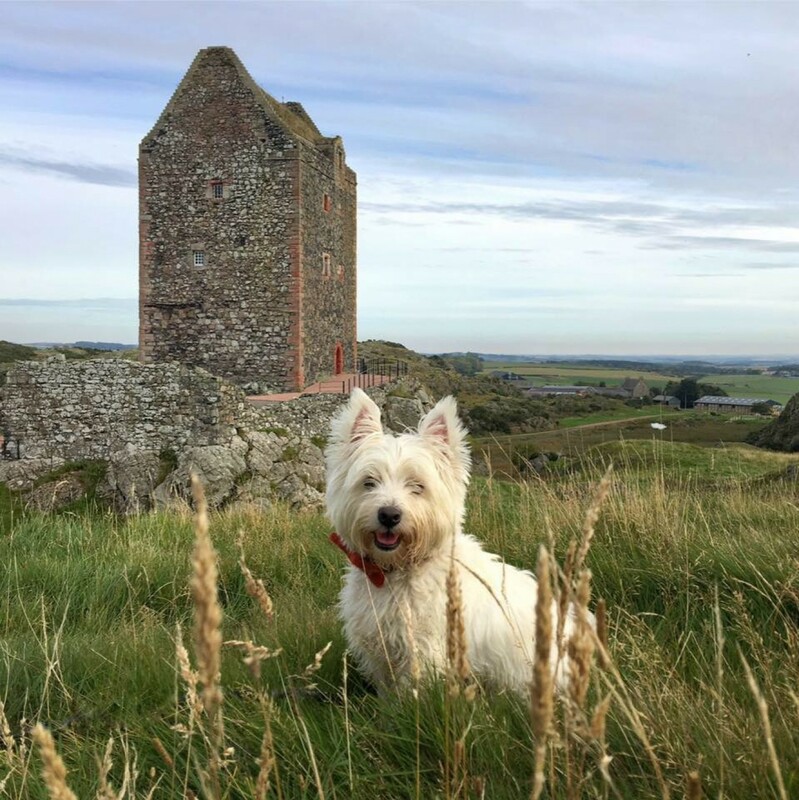 Built on-site, the sculptures were completed on 27 November 2013 and quickly became as intrinsically Scottish as Edinburgh Castle, Irn-bru and West Highland White Terriers! Created by artist Andy Scott, each 30-metre high sculpture weighs 300 tonnes. They’re a tribute to the working horses which once toiled in this industrial heartland of Scotland – towing barges, pulling heavy loads and dragging farm machinery behind them. Although symbolic of Scotland’s working horses, The Kelpies are also steeped in Scottish mythology. A Kelpies is a water spirit, usually seen in the form of a large black horse, but with the ability to shapeshift into human form. They’re found beside lochs and rivers and although they look beautiful, they’re deadly. They befriend humans, enticing them on to their back, before riding off into the water and drowning them. As we strolled towards the Kelpies, we passed a lovely area of wetland which had been reclaimed from wasteland. It was rich in plant and animal life, and it was hard to picture it having been anything other than a pretty and peaceful spot. We tried to creep past a sleeping swan but the boy was having none of it. He stopped to stare, absolutely transfixed – his wee tail wagging ten to the dozen. The stretch of canal by The Kepies was busy with boats. We grabbed a coffee and stopped to watch a barge as it passed through a lock. There’s something quite wonderful about watching the water rise and fall in a canal lock. A few months ago our guilty pleasure had been watching ‘Canal Journeys’ – a TV series following Prunella Scales of Fawlty Towers “Baaaaaaasil” fame, and her thespian hubby Timothy West, as they explored the canals of Britain and Europe. How rock n roll are we?! In our defence we chalked our viewing off as travel research, and combined it with a glass of wine or three! We lingered by The Kelpies a while, straining our necks to snap photos of them. From the roadside their scale is impressive, but up close they’re huge. On a sunny day, when the light hits them just right, they shimmer and glisten like the water in a cool mountain stream. As we admired their impressive scale the sky turned black and they appeared to glow. The contrast of black sky and silver kelpie was stunning. Our next destination was the Falkirk Wheel but en-route we passed a slightly older Falkirk attraction. The Antonine Wall is a Roman turf defence which stretches for 60 kilometers across the Central Belt of Scotland, from the River Clyde in the west to the River Forth in the east. When it was built in 142 AD to keep marauding Caledonian tribes out of Roman Britannia, it was a feat of engineering on a scale never seen before in Scotland. Sections of the stone foundation and defensive ditch can still be seen today. As you know I’m a die hard history geek. I find Roman history fascinating, but having visited the awe inspiring ruins at Pompeii, Herculaneum and Rome I find Scotland’s Roman remains a tad underwhelming in comparison. That’s not to say they’re not worth visting – history’s history after all, and even by today’s modern building standards, the Antonine Wall is still a pretty impressive big ditch! Parking at the Falkirk Wheel, we couldn’t resist snapping a photo or two of the boy posing with the miniature kelpie sculptures in the car park. Despite being a fraction of the size of the originals, they loomed like giants next to the Wee White Dug. Before heading down to the Visitor Centre, we climbed uphill for a closer look at the aqueduct which carries boats to and from the Falkirk Wheel. I loved the big, looping arches above the water. I’m quite partial to a bit of symmetry – now that’s probably an understatement, as I have OCD for symmetry. I like symmetry – a lot. I see my OCD as a minor quirk, and remain eternally grateful that I didn’t get the obsessive house cleaning version! Not far from the aqueduct stands the Rough Castle Tunnel. It runs beneath the Antonine Wall and is wonderfully atmospheric. Walking along a narrow, dark path with water as black as the grave next to you, it’s hard not to feel spooked. As ever, the boy took it all in his stride and was eager to explore. I trod a more cautious path behind the pint-sized trailblazer! In was nice to leave the cold, damp tunnel and step back into daylight. Near the Visitor Centre we found a spot with a good view of the Falkirk Wheel, and watched in awe as it picked up a barge full of people and transported it 35 metres up into the air and onto the viaduct. At the same time another barge was lowered down from the viaduct. It was really impressive and a wee bit hair-raising to watch. I’m not a fan of heights but I’ll definitely brave the wheel soon. The wheel celebrated its 15th birthday recently, yet it’s hard to believe that it’s still so young. Like The Kelpies it’s become one of Scotland’s most iconic symbols, which makes it seem like it’s been around forever. It’s an amazing feat of engineering, and is the only boat lift of its type in the World. Although it’s a popular tourist attraction, it has a practical purpose too – it links the Union and the Clyde Canals. As we were trying to decide where to go for lunch the sun made an unexpected appearance. The merest hint of sunshine made the on-site hot dog van impossible for us to resist. We grabbed a picnic table with a view of the wheel and feasted on hot dogs, fries and Irn-bru. They even had soggy hot dog onions – yay. None of this crispy onion nonsense for me. Hot dog onions should always be served boiled, hot and soggy! Lunch hit the spot perfectly, despite the lack of soup. Our final visit of the day was to The Pineapple, which is located 10 miles north of Falkirk. The Pineapple is easily Scotland’s most bizarre building. Commissioned by the 4th Earl of Dunmore in 1761 the summerhouse must have raised some eyebrows when it was built. It’s not known for sure who the architect was, which could suggest he didn’t want the strange folly to become his legacy. In its early days there was a hothouse in the ground floor of the building. Amongst the exotic delights that were grown in it were pineapples. Pineapples grown in a pineapple, it’s no wonder the British aristocracy have a reputation for being a bit batty! The Pineapple isn’t open to the public other than as a holiday let, but the large walled garden which it sits in is. It’s managed by the National Trust for Scotland and is definitely worth visiting if you’re ever in the area. It’s a pleasant place for a walk, plus you get to see a gigantic pineapple, which isn’t something you’ll see every day. As we were exploring the garden the heavens opened on us. I would have been happy to take shelter in the woodland trails on the estate but Mr G flew back to the car as if there was a serious risk of him dissolving in the rain! Although we didn’t originally plan to Visit Falkirk that say, we ended up having a great time. There’s more to Scotland than lochs, mountains and glens. And although I adore the scenic spots, I also love Scotland’s urban landscapes and industrial heartland. They played a huge part in shaping the country that I known and love today, and have lots to offer visitors. So, if you’re planning a trip to Scotland maybe you should visit Falkirk too? Every time when I’m visiting Scotland my “home base” is Falkirk. Thus I know the Wheel and the Helix quite well. Both places are awesome and proof of great engineering. Your pictures are beautiful and the wee dug is an enjoyable bonus to them. Nicely written blog – all together a great read on a sunny morning in Germany. Thank you, so glad you enjoyed. Falkirk is a great base. Sadly it’s raining in Edinburgh today (again)! Hi, love this post and your wee dog is so cute. saw your message on twitter synchronicity indeed. The Kelpies were awesome. Amen! What a marvelous adventure! Thanks for sharing it – and the gorgeous photos – with your readers. Thank you as ever for your kind comments. Thank you for sharing. Going to see the Kelpies etc after the theatre in Pitlochry. Really looking forward to it now. Would love to visit the Falkirk Wheel sometime! Glad to know that Scottish weather is living up to its reputation. You are so right, there is more to Scotland than hills, glens and lochs – Edinburgh and the Reformation / Glasgow and the Tobacco Industry / Lobby Dosser and Rank Badyin. What a great connection – I can see the similarity to The Kelpies. The weather has been hellish. Summer is now officially my least favourite season as it’s when the weather is most disappointing. I didn’t realise you can get up to the top of the wheel without being on a boat. I took my parents on the tourist boat there last year but didn’t notice there was a walkway to the side. Yes, it’s great as you can explore the creepy tunnel too. Just read your blog to my husband, so enjoyed it. We could could imagine being there with you – so well written.